There are many great reasons to take a summer vacation to Myrtle Beach. One of the top reasons is definitely the amazing entertainment options to enjoy around the Grand Strand. If you're lucky enough to be making a trip to Myrtle Beach in mid-June you can't miss the 2018 Toughest Monster Truck Tour as it comes to the Myrtle Beach Speedway for their Beach Devastation show. This high-octane exhibition will be jam packed with horsepower, speed and gravity-defying jumps from the biggest names in the monster truck circuit. Taking place over June 15th and 16th at the Myrtle Beach Speedway, the Beach Devastation show will pit a lineup of eight huge monster trucks against each other in a competition showcasing their speed, agility and power as they scream around the dirt course and crunch cars under their massive 66-inch tires. These mechanical beasts weigh in at over five tons and produce over 2,000 horsepower, roaring around the course at speeds of up to 70 miles per hour. And some of the sports biggest names will be competing to be the baddest truck of them all, including Snake Bite, Buck Shot, Big Hitter and the one and only Big Foot, the original monster truck that started it all nearly 40 years ago. The monster trucks rev their engines and are off to the races at 7 PM on Friday and Saturday night. Adult general admission tickets are only $15 and tickets for kids ages 3-11 are only $10. To get up close and witness the power of these huge machines you can purchase a Pit Party pass for only $10 more and check out the trucks beginning at 4:15 PM. Guests can also purchase VIP tickets that include admission, Pit Party pass and special VIP grandstand seating to get the best view of all the action. 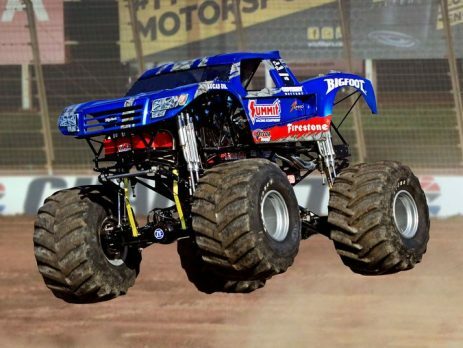 This event is sure to be one of the most exciting of the summer, so don't miss the Beach Devastation Monster Truck show during your Myrtle Beach vacation! And even if you haven't booked your trip to Myrtle Beach yet, there's still time to reserve at great Myrtle Beach resorts like Atlantica Resort or Myrtlewood Villas for an unbeatable price. Visit the partner property websites of Beach Vacations and see how easy and affordable booking a Myrtle Beach vacation can be!